The Chilean flamingo is about 41 inches tall (the male is somewhat larger than the female) and weighs approximately 5 pounds. It is lighter in color than other flamingo species, with pink edges on its outer wings and black under-feathers. It has bright red knees and feet. The neck and legs are longer in proportion to its body than any other species of bird. The 3 front toes are fully webbed, and its hind toe is elevated. It has a unique bill: the lower beak is the larger of the 2 and the upper beak fits into the lower like a lid. Broad areas of the beaks have fine comb-like teeth (lamellae). The young are grayish brown when born and do not look like the adult for 3 to 4 years. 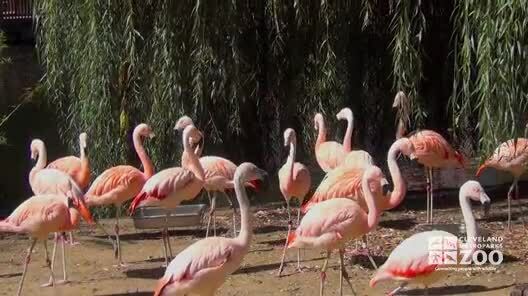 The range of the Chilean flamingo is South America from Southern Brazil and Peru to Tierra Del Fuego. The habitat of the Chilean flamingo is salt lakes high in the mountains both winter and summer. The egg will hatch in 28 to 32 days. The Chilean flamingo flies with others in long skeins with its neck straight out and its feet trailing. It is very vocal in flight, honking much like geese do. It has few predators since it lives in such inhospitable places: highly alkaline ponds and lakes surrounded by desert-like waste high in the mountains. Both male and female share in building the nest, which is a cone- shaped, foot high, hardened mud mound with a concave depression in the top for the egg. It uses its unique bill to feed in the water with its head upside down. The top of the bill is bottom-most and the larger lower bill above pumps against it to sieve water and mud through the comb-like teeth and slits in the bill. It either swings its head back and forth while it is feeding or its tongue helps with the pumping by moving back and forth four times a second, drawing and expelling muck through the teeth. The tongue itself also has numerous "teeth" that scrape the collected food from the filters in the bill. 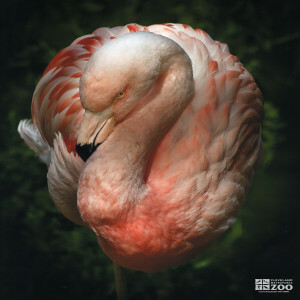 Some Chilean flamingos pair for years while others take a new partner each breeding season. It should be noted that they may not breed if food is in short supply. Breeding takes place in the fall (October/November). It begins with a flock of 20 - 50 birds with their heads in an "alert" posture, flagging from side to side in a horizontal arc. The whole group increases the tempo of this display then suddenly stops. They then begin "wing salutes" and rush back and forth 50 feet or more several times. During this rushing the birds pair off and leave the group. They touch their beaks and intertwine their necks & also do a ritual pecking & sparring for several minutes. If the courtship is successful they mate; if not they will split up and look for different partners. Copulation takes place while bathing. When the single egg is laid in the nest, the male and female take turns incubating it. The new chick is able to leave the nest 3 to 4 days after it is born. They form into groups of several hundred and forage for tidbits of food. Both parents feed their chick a "milk" that is secreted from their crop gland. It is about 15% fat and contains large amounts of canthaxanthin (the red pigment that colors the feathers). Parental feeding continues until the chick's bill is fully developed.